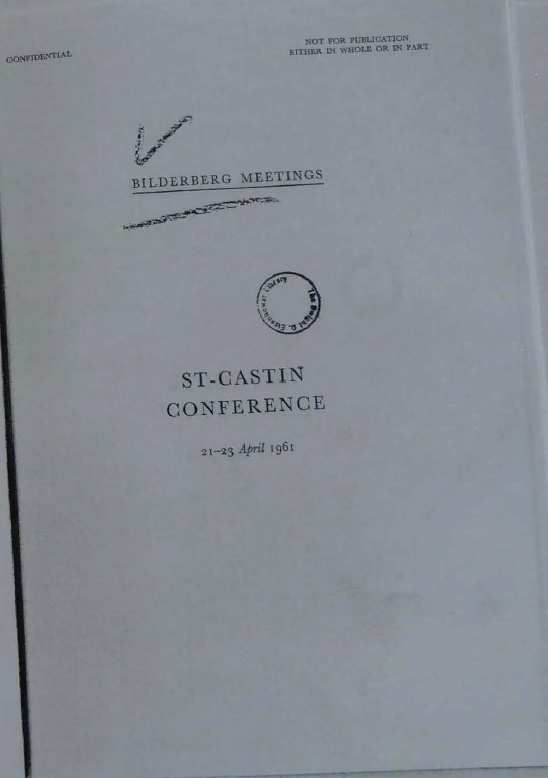 The tenth Bilderberg Conference met at St-Castin near Quebec on 21, 22 and 23 April 1961. It was the first time the conference was held in Canada. The previous meetings have been held in the Netherlands, France, Germany, Denmark, Italy, the United Kingdom, Turkey, Switzerland and in the United States. Seventy-two persons from twelve different countries attended. The United States and Canada were strongly represented, the United States by twenty-two and Canada by sixteen persons. It is not the purpose of these conferences to attempt to make policy or to recommend action by governments. The sole object of these meetings is to reach a better understanding of prevailing differences between the Western countries and to study those fields in which agreement may be sought. To reach this aim men of outstanding qualities and influence are brought together in circumstances where discussions can be frank and where arguments not always used in public debate can be put forward. The discussions are so organized as to permit a broad and frank exchange of views to take place. They are held in conditions of strict privacy and neither the press nor observers are admitted. No resolutions are passed and no statements have to be approved by the participants who are free to draw their own conclusions from the discussions. Those invited to attend the Bilderberg Meetings are chosen from different nations and from all fields of public activity and include politicians and statesmen, diplomats, businessman, intellectuals and leaders of public opinion. All participants attend these meetings in a purely personal capacity and the views they express are their own and do not necessarily represent those of the organizations or parties to which they belong. The various items on the agenda are mostly introduced by rapporteurs who have prepared papers on these subjects. The documents are as far as possible circulated in advance of the meetings. 1. What initiatives are required to bring about a new sense in leadership and direction within the Western Community? a. The role of N.A.T.O. in the world policy of the member countries. b. The role and control of atomic weapons inside N.A.T.O. 2. The implications for Western unity of changes in the relative economic strength of the United States and Western Europe. In the following text the introductory reports and the views expressed during the debates are summarized. In the annex a summary will also be found of a speech delivered off the record by a Canadian participant on the impact of the Communist economic penetration of the Western world as well as a summary of a memorandum on an analogous subject by a German participant. No discussion has followed.